The Five Sisters Crafternoon took place last weekend and it was, as usual, a much needed bonding time. Last year Heather couldn't make it as she had just moved out to Houston, Texas. This year she flew in but unfortunately my sister Lindsey was sick with a stomach bug. It was once again the Four Sisters Crafternoon this year. 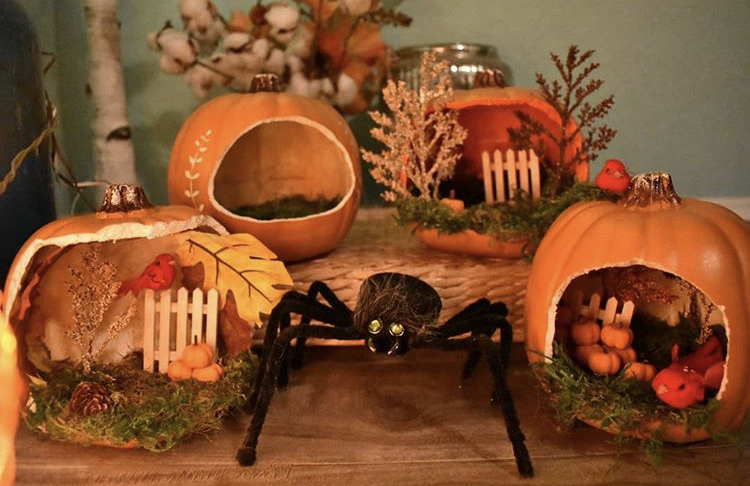 I hosted it this year and decided to make pumpkin dioramas since Lindsey wanted to give that a whirl this year (which I still saved her the goodies to make it so she will get to it). My sister Dawn's is front left, mine is next (I didn't finish as I decided to go a different direction and have much to do), Heather's is the third with the trees in front (she wants me to find a black cat to put in front of the fence) and Darby's is the one to the far right. I picked up plastic carving pumpkins, moss, floral branches, mini pinecones and pumpkins, small birds and colorful leaves and assembled as desired. I did try my hand at carving mine and liked the effect. 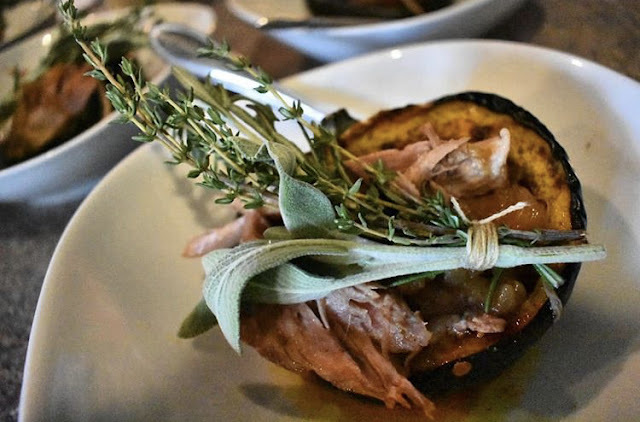 I made one of my favorite meals, roasted acorn squash stuffed with cider braised pork, the recipe can be found here. It was a wonderful evening full of laughs and some serious conversations. The October word of the day for today is Dracula. I read Bram Stoker's Dracula several years ago and was glad I waiting to read it until I was an adult. I think I grasped more of the nuances of terror from it rather than if I was younger. I enjoyed the tale and it helped me to appreciate more the films and adaptations that found inspiration from Dracula. 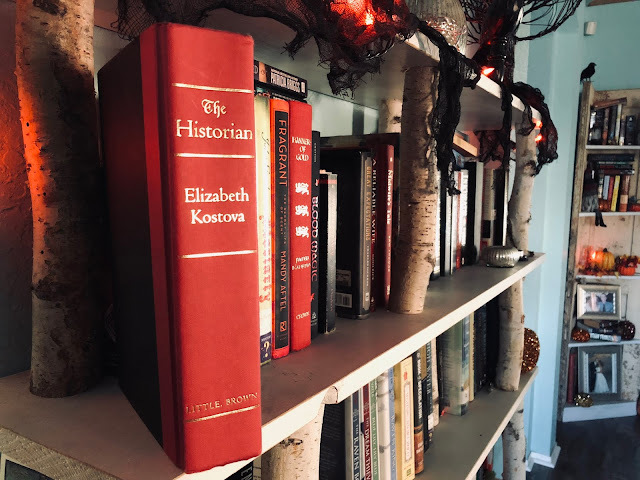 One of my favorite books that follows Dracula into modern times is The Historian which I think I read last year or the year before. My husband and I enjoyed watching Van Helsing and of course without Dracula we probably wouldn't have the Twilight series which I did very much enjoy when they were released. The most fascinating of all though was learning more about the actual Vlad Dracula who was perhaps one of the most dark figures in history. Are you are fan of Dracula? Are there any Dracula inspired books I need to read? Movies I need to watch? Thanks! It is a nice tradition and something I look forward to every year. I hope we can continue it no matter where we end up. He is bare. I could have just used what I had but I wouldn't have been as happy. May as well do it like I would like. The fairy lights were a component I wanted to add and couldn't do it last but needed it get them in first. 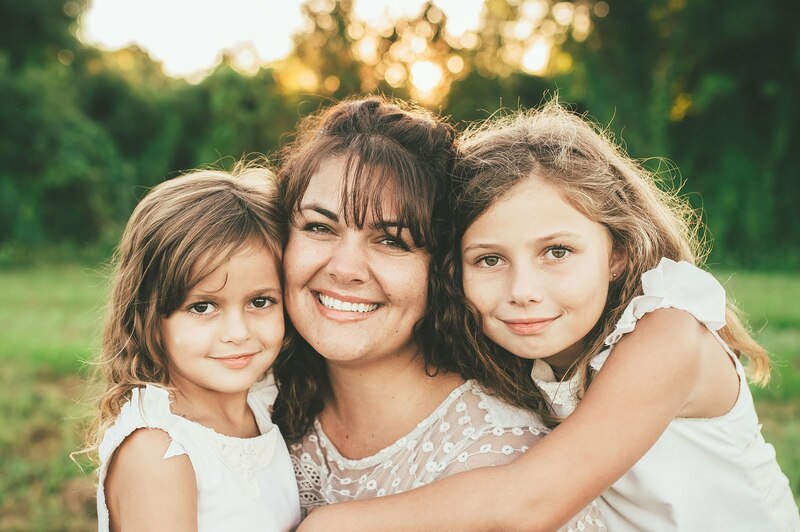 What a beautiful tradition you and your sisters have! And your pumpkins are wonderful! Thank you for that recipe - it looks amazing!!!! You always inspire me so much. Thank you! Life goes so fast. It seems once a year isn't nearly enough but then it is here in a flash. I can't wait to finish up my pumpkin. And that pork and squash meal could be made Whole 30 rather easily I think. <3 I hope you have been doing well. I hope your Freddie talk goes well! I wish I could hear it. Yay for sisters crafternoons, these are darling, can't imagine what yours will be. I may try fairy garden jack-o'-lanterns if I get around to it. Oh yum, you could give the food network star contestants a run for their money with that perfect looking dish, complete with herbal flourish. I hope you do get around to it! If so please share it with us. <3 I am sure it will look adorable. I couldn't resist the bouquet of herbs. Too much fun to not add. I love making bouquet garni. I got a lot of stuff to make pumpkin dioramas a few years ago but have yet to actually do it. Those turned out very cute! I am hoping I can finish mine before the season is out but I am not counting on it. Maybe you can start and do it a little at a time? My sisters did do a fabulous job on theirs! I loved how they turned out.